Last Sunday me and the family decided to take a little trip to Bicester Village, it was actually my other half's idea much to my surprise and I definitely wasn't going to say no was I ?! For those who are like eh! what's she on about Bicester Village?.. well Bicester Village is a huge designer outlet in the UK; Oxfordshire to be precise, you can find brands such as Dior, Marc Jacobs, Mulberry, Céline and my favourite The Cosmetics Company. Oh Yes!! and everything is at super discounted prices. I have been a few times as I don't live too far away from Oxfordshire but I do know some people travel miles to come to this place..and MY does it get busy! 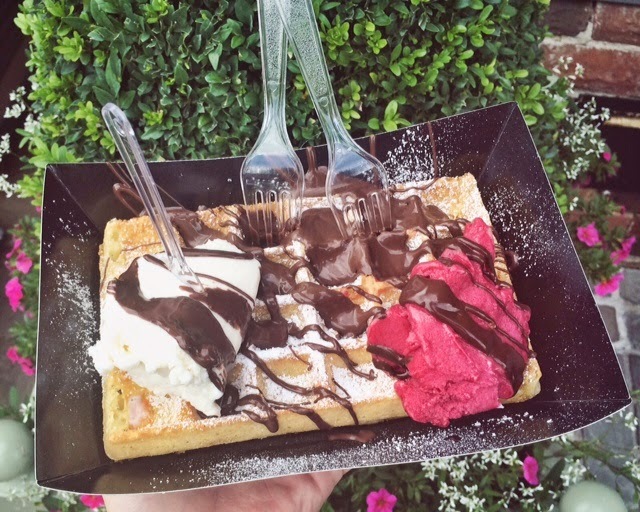 Its such a beautiful place, everything is out door and there are some fabulous places to eat such as Jamie Oliver's Fabulous Feasts, and a delicious warm waffle and ice cream bar. 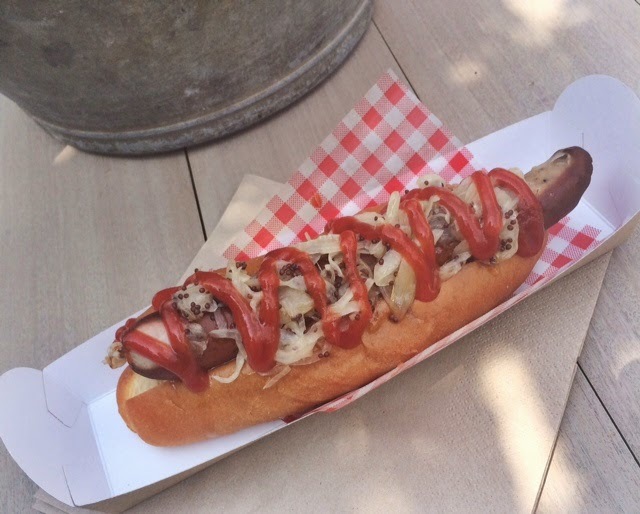 ﻿﻿﻿I was really greedy and had a hot dog from Jamie's then Waffle on the way home.. it looked to good to refuse, plus I shared with the family so don't judge haha *covers eyes with hands. Now on to what you all came here for, the haul. As I already said The Cosmetics Company is my favourite of them all, and if your anything like me this would be yours too, its a beauty haven I tell ya! 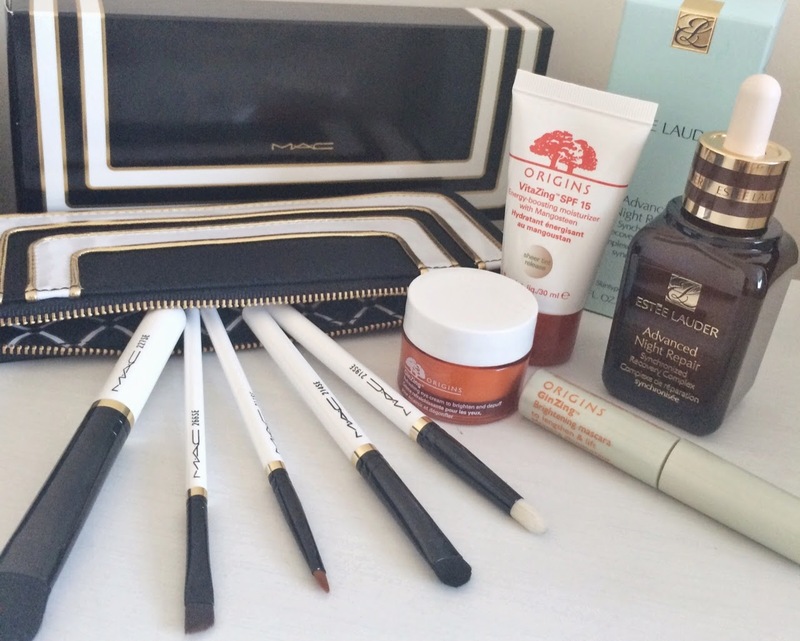 it has all these amazing beauty brands such as MAC, Estee Lauder, Clinique, Bumble and Bumble and Bobbi Brown. Yep you guessed it at discounted prices too. This is also the place to catch up on all those MAC limited edition collections you've missed. 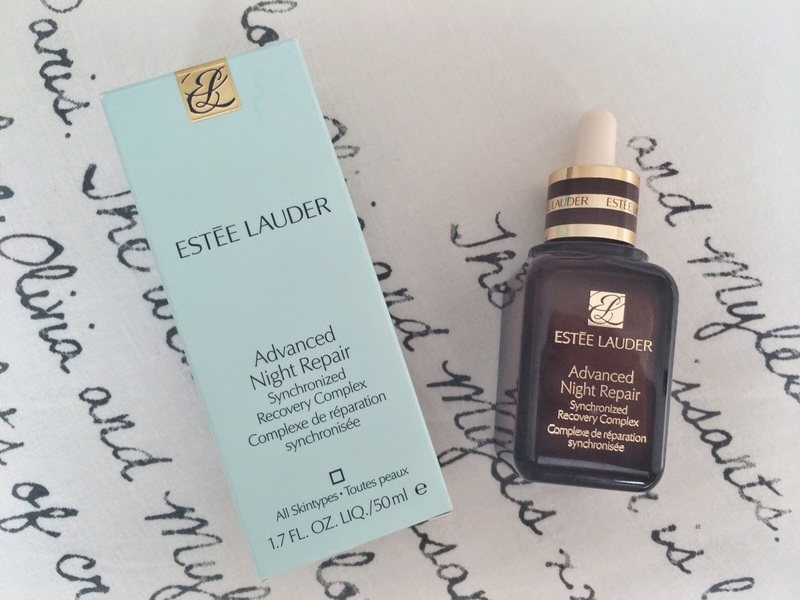 The first thing to make its way into my basket was the Estee Lauder Advanced Night Repair, I have literally been eyeing this up since forever, its one of those cult skincare products I have wanted to try but been put off by the eye watering price. As soon as I spotted it I checked the price and wham it was mine. Next I picked up the one of the MAC limited edition smoky eye brush kit from the old Stroke of Midnight collection. 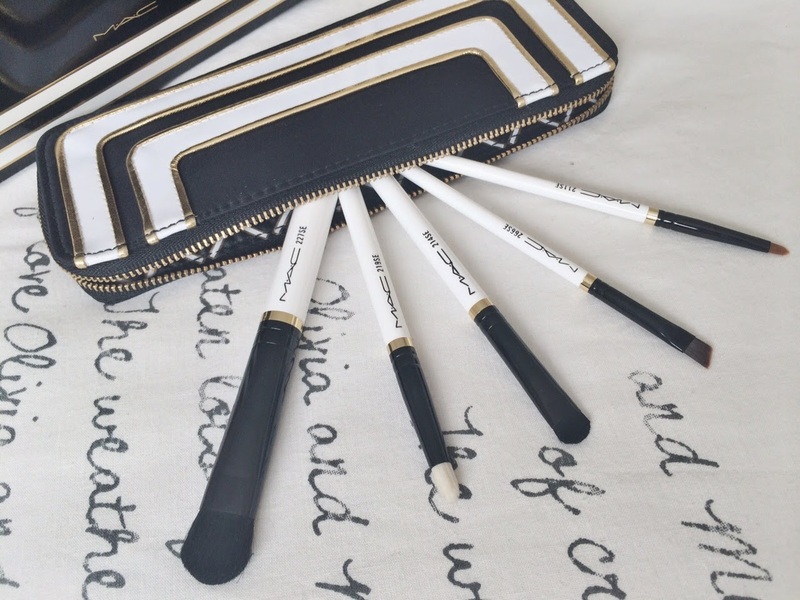 I have always wanted to try some MAC brushes and I thought this was my perfect opportunity, it came in a cute little monochrome zip bag with 5 amazingly soft eye makeup brushes, I cant wait to give them a go and try some new eye looks. 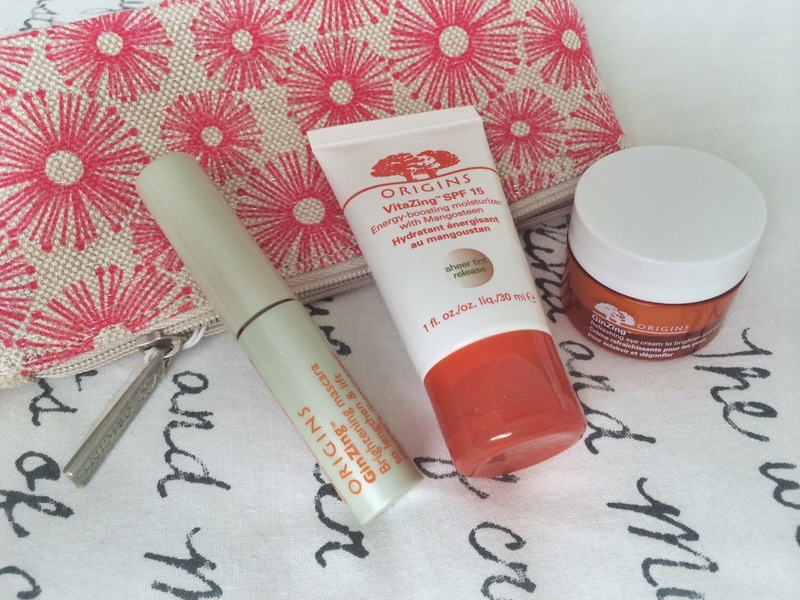 Next up is this Origins Skincare set, I was looking all over place for the GinZing eye cream as I've always wanted to try this too, I couldn't find it on its own but then I spotted it as part of this set which was even better really as I also got a cute little makeup bag, a 30ml tube of VitaZing Energy-boosting moisturiser and a 5ml GinZing Brightening Mascara (I have never heard of this one so if you've tried it let me know please). I paid £18.75 RRP £25...The eye cream is worth £23 alone in most stores. Then my very lovely, generous fiancé decided to treat me to this beautiful Links of London bracelet after he spied me trying it on. 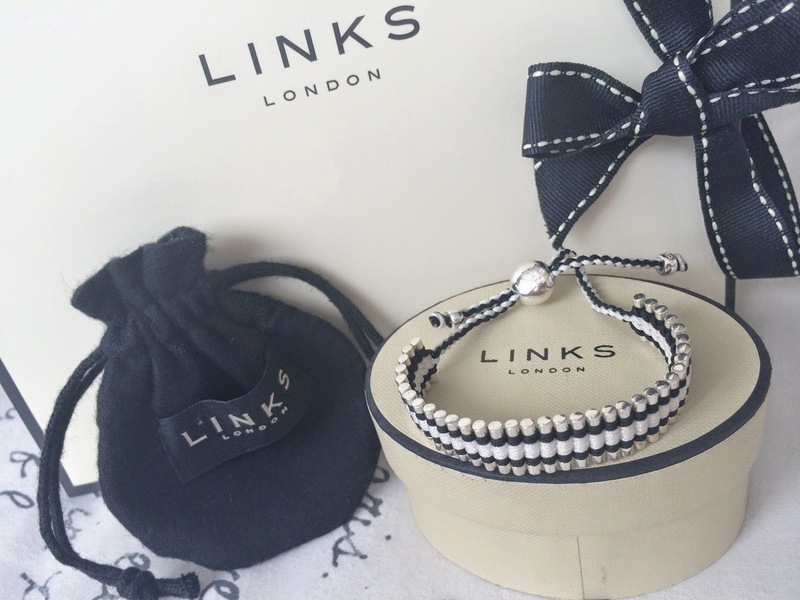 Its a gorgeous black and white pull tie friendship style bracelet with silver accents, it compliments my other silver jewellery perfectly. Over all it was a great day out and brilliant place to visit, if you can you need to go, just make sure you save up as I'm pretty sure you'll find these prices hard to resist. I would have liked a Mulberry handbag myself *sigh. I wish I took some pictures of the Village to show you but I wasn't really planning to post about it, I thought about doing a haul post then Miss Makeup Magpie and others gave me the twitter nudge I needed, so I hope everyone liked my first ever haul post. Have you ever been to Bicester Village? What are your thoughts? You picked up some amazing things! Love the Mac brush set!